One of TED’s most watched talks was by Amy Cuddy, the Harvard professor who captivated the world with her personal story and her advice to use a “power pose” a la Wonder Woman to gain confidence. 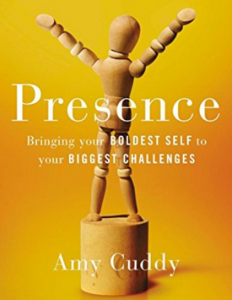 Apparently, a publisher took note of her massive audience and convinced her to write a book, which came out this month, called “Presence.” I bought a copy via Audible to listen to while I did my daily marathon walks. If ever there were a reason to have a platform of 30 millions fans, this is it. If you have 30 million views of your TED talk, a publisher will beg you to write a book—even if you don’t have much more to say! She does a great job in the introduction of writing the absolute best personal story ever, and of describing her thesis: if you strike a power pose, you will feel powerful. She said that in 21 minutes in the TED talk. And she turned it into 9 hours and 18 minutes of an audio book. Like many subject matter experts, she invents her own vocabulary to make her ideas sound better. Even the title of the book “Presence” – her somewhat unique word – is really a substitute for confidence in some chapters and mindfulness in others. However, the other 9 hours in the audio book shares the underlying social science research to back up her claim – going back to the father of American psychiatry William James in the late 1800’s. Listen to Chapter 10 to actually find out how to stand and breath. So, if you want to spend 9 hours and 18 minutes of your life wading into the weeds of her research, be my guest. If you’d like to get the gist of the talk, listen to TED talk for less than 20 minutes. Or you might have heard Mark Victor Hansen say “fake it until you make it” 10 years ago. She actually paraphrases this in her book (fake it until you become it)! Or you might have heard Tony Robbins say the same thing about posture and emotional states during his presentations 20 years ago. I think he took less than 17 minutes to say it, though.